After all the holiday parties are over, the presents are put away, and the decorations are taken down, there is one thing that I look forward to immediately after the New Year. That thing is walking out onto my front stoop, opening up the mailbox and retrieving that first of many garden/seed catalogues. It is actually a love/hate feeling. I love looking at the pictures, dreaming and designing my 2011 kitchen garden, but I hate the fact that I still have to wait what seems like an eternity until the first frost-free date. And where I live, that date falls in the month of May! The catalogue that I received yesterday had the most beautiful looking sliced tomato on the cover. It made me think of walking past my tomato plants and smelling that tomato vine smell--so earthy, so wonderful. And then I thought of the large pots of basil planted nearby. Mmm...basil and tomatoes, how I miss that fresh summer taste. Fortunately, I can still enjoy that taste of basil and tomatoes in the dead of winter and it is in this soup. 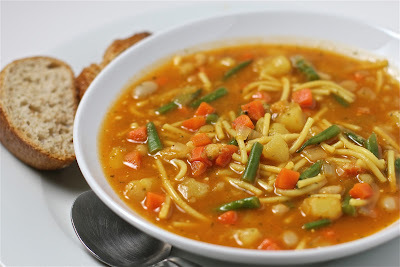 Soupe au Pistou is a French Provençal vegetable soup made with a pistou. Like the Italian pesto, a pistou is a "pounded" sauce of garlic, basil, tomato, and cheese. And since I have some frozen basil pesto that I made in the freezer from the end of last year's harvest, this soup is on the menu tonight. I make the soup base with chicken broth, onions, potatoes and carrots. I then add some haricots verts (french green beans), navy beans, and broken spaghetti noodles and season with a bit of saffron. To add body to the sauce I crumble in a piece of day old white bread. But what really gives this soup a lovely fresh taste and velvety texture is stirring in a mixture of tomato paste and pesto. Ladle into bowls and serve with crusty white bread--it is the next best thing to walking in my garden when it is 20º degrees outside. In a large stock pot, bring the chicken broth and water to a boil. Reduce to a simmer and add the onions, carrots, potatoes, and seasonings. Cover and simmer until the vegetables are tender, about 40 minutes. Meanwhile, in a medium bowl, stir together the pesto and tomato paste until thoroughly combined. Twenty minutes before serving, add the haricot verts, beans, bread, and pasta. Bring to a low boil and cook just until the green beans are cooked through, about 15 minutes. When ready to serve, gradually add 1 cup of the hot broth into the pesto/tomato mixture. Pour the mixture into the rest of the soup and stir until combined. Serve with hot bread. Enjoy! This would be lovely with a tarte aux pommes or oatmeal apple crisp.. Thanks for the adaptation. Those would be lovely sweet endings to this meal. A nice, warm bowl of soup sounds great on this cold (make that "really cold") day. Summer can't come soon enough or stay long enough. This soup fits the bill any day though. Can't wait to try it! Thanks. Ooh, this looks wonderful! I'm still eating leftover veggie chili from the weekend but this soup is next! Thank you. Veggie chili sounds good too! Your soup is delicious. My grocery store didn't have haricot verts so I substituted regular green beans. The smaller beans would have been better. After being outside with the snow blower all afternoon, Dad was glad to have a bowl of warm soup. So glad you enjoyed it:) Thanks for letting me know. Wow, I love your blog and have been sharing some of your recipes with all of my Facebook friends. Keep up the beautiful work!